Better Writing Right Now is a step-by-step guide to writing. It takes you from the blank page and walks you through the steps of the writing process so that you can conquer any school writing assignment—including timed essay exams and research papers. It also provides tips and formats you can use for writing resumes, cover letters, general business letters, memos, e-mails, and reports for work. Along the way, you’ll learn basic writing skills, and you’ll gain the confidence you need to succeed in any situation that requires you to write. 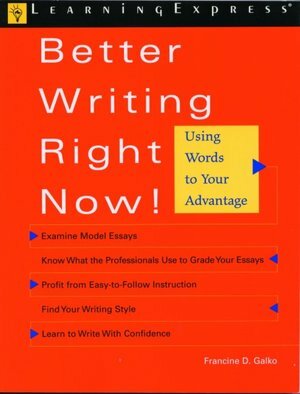 This book gives you more than the information you need to become a better writer. It also gives you example after example of strategies that work and provides opportunities to practice those strategies. Take advantage of each practice, because here you can safely experiment with techniques and develop expert skills before you have to use them for class, work, or correspondence. Your work in this book can be for your eyes only—so stretch your fingers, stretch your imagination, and don’t be afraid to see your writing take shape.